Mervyn King: "Warnings are unlikely to be effective"
The Bank of England governor and the chancellor have clashed on what needs to be done to control banks and prevent a repeat of the financial crisis. 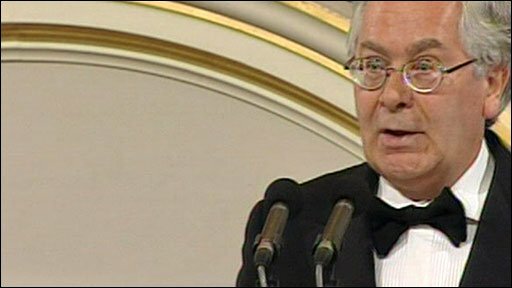 In his annual Mansion House speech to the City, Mervyn King called for more authority to intervene in the actions of banks seen to be behaving riskily. But Alistair Darling told the same event he had no plans to fundamentally change the system of regulation. The Liberal Democrats said Mr King's attack was "devastating". The governor said that if a bank had been allowed to get so large that it was too big to fail, then it was too big. And Lib Dem treasury spokesman Vince Cable said this meant that "if major banks are going to continue to rely on taxpayer guarantees, they must be broken up and their investment banking, gambling, operations split off from straight forward personal business banking". Since the Mansion House speeches, Mr Darling has insisted that the government and the Bank were "committed" to making sure that the wider economy was "protected so we're not faced with a banking crisis like this in the future". Meanwhile the chairman of the Treasury committee, John McFall, said he was surprised at Mr King's comments, given that the Bank governor had been given the opportunity to raise the issue at MP hearings into the banking crisis. But he added that he believed the governor had been "sending a message to banks and financial institutions that it was not business as usual". The speeches came as the US government announced a major reform of banking regulation to prevent future financial crises. The overhaul will require big banks to put more money aside against future losses to curb excessive risk-taking. "This highlights the fact that the Americans are one step ahead in dealing with the risks associated with new derivative products which are traded outside regulated markets," Mr Cable said. In the UK, oversight of the financial system is carried out jointly by the Treasury, Bank of England and the City watchdog, the Financial Services Authority. The Bank has been given a role to analyse threats to financial stability - but cannot instruct a financial institution to act if it is perceived to have been behaving too riskily, or growing too fast. There are three ways to fix the problem. You can prevent banks from taking on too much risk, you can prevent them from getting too big or you can try to convince them that they will not get bailed out. We will probably end up with a combination of all three. And even that won't be enough to prevent bank crises from happening again. 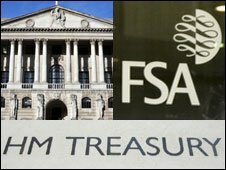 It is the FSA which is charged with reining in any bank that it is feared may be expanding too fast and be at risk of running into trouble. Mr King added that the major lesson of the financial crisis was that these authorities lacked the means to take effective action to prevent excessive risk taking at banks. "Warnings are unlikely to be effective when people are being asked to change behaviour which seems to them to be highly profitable," he said. "If some banks are thought to be too big to fail, then, in the words of a distinguished American economist, they are too big," Mr King said. He added that the Bank needed greater powers to allow it to fulfil its new role of promoting financial stability and could no longer act "like a church" whose congregation "ignores its sermons". "So it's not entirely clear how the Bank will be able to discharge its new statutory responsibility if we can do no more than issue sermons or organise burials." "Blaming individuals is no substitute for acknowledging the failure of the system," the governor said. The chancellor, on the other hand, did blame those at the heads of financial institutions. And while he said there could be no return to "business as usual" for UK banks, he did not lay out plans for radical, structural change. 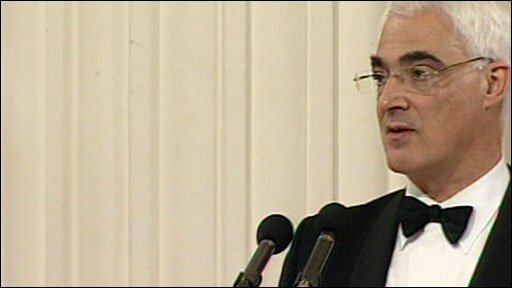 Alistair Darling: "We cannot go back to business as usual"
Instead, he called for "a change of culture" in which bank staff were "rewarded for long-term success, not for failure". "You can't remove all risks, but you can understand where risks lie and make sure banks have in place proper plans to mitigate those risks and deal with the possibility of a failure," he said. "Bank boards must have the right people of the right skills and the right experience to manage themselves more effectively," the chancellor said. "And they need to be equipped to ask the right questions. "Their focus must be on long-term wealth creation and not short-term profits." BBC business editor Robert Peston said the comments by Mr King were bound to be seen as an attack on the chancellor because "the Treasury has resisted significant changes to the allocation of regulatory responsibilities between the Financial Services Authority, the Treasury and Bank of England". He added that the governor had, at one point, been opposed to the idea of the Bank becoming a super-regulator. "Since then he - and quite a lot of others - have spotted that it's tricky for a central bank to deliver economic stability if it has no role in promoting financial stability," our business editor said.